At the turn of the 20th century, HRM (His Royal Majesty) Rex Goliath was the treasured attraction of a Texas circus. People came from far and wide to behold the 47 lb. bird, billed as the "World's Largest Rooster." 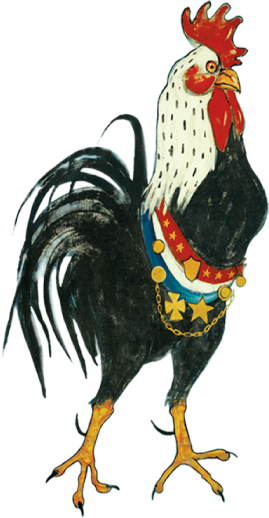 Our label replicates the one-of-a-kind vintage artwork from the circus banner that hung above Rex’s roost, and we proudly honor Rex with our premium varietal wines. Our wines are a tribute to Rex's larger-than-life personality, with bold, fruit-forward flavors that are sure to please. In essence, Rex is all about letting BOLD fruit flavors express themselves in an easy-to-drink, worry-free fashion. Bold Wines. Fun Times. Rex Goliath wines offer bold, fruit flavors for every occasion. Enjoy delicious recipes and pairings from Rex's kitchen.